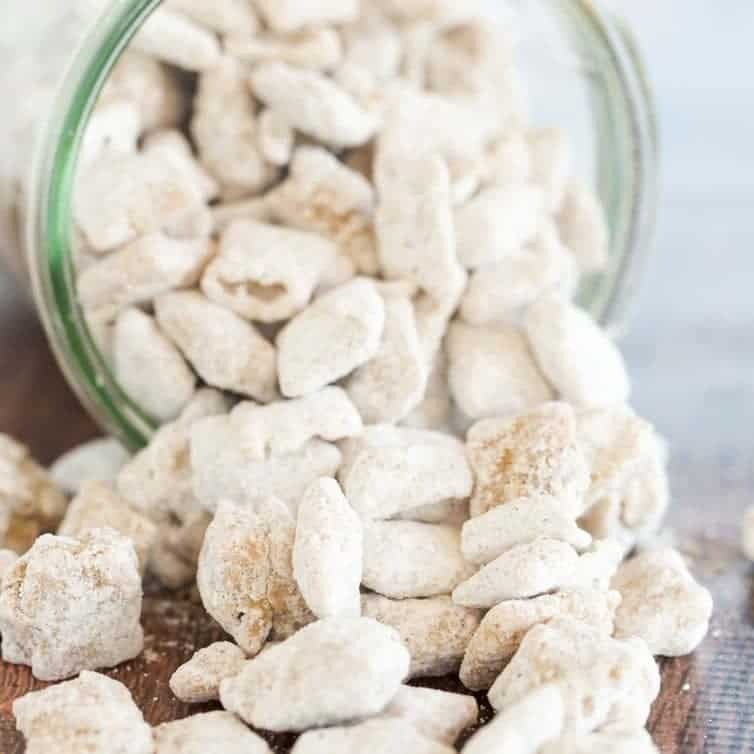 Snickerdoodle Muddy Buddies are a cinnamon and sugar-coated rendition of one of my favorite snacks – candied Rice Chex! Let’s talk muddy buddies, shall we? If you’re not familiar with the name (it’s kind of weird, right? ), you may have also heard this candy referred to as puppy chow (even weirder!). 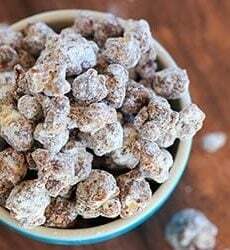 With the original version, you take Rice Chex cereal, coat it in a mixture of melted chocolate and peanut butter, then toss it in powdered sugar. It is SO incredibly addicting, as you could imagine. The best thing? There are a million and one different variations that you can make based on that original recipe. A couple of months ago, I got a Twitter DM from a reader-turned friend-turned neighbor with a picture of the Chex brand snickerdoodle muddy buddies. 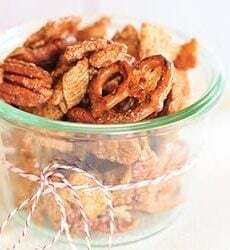 She said her husband bought them for a road trip, and when she saw them she thought of me – first, that a homemade version was probably in order; and secondly, that they would make a great snack to take along to the hospital with me. She was right on both accounts! Less than a week later, I started working on my own recipe and found the perfect balance of candy coating, cinnamon and sugar. 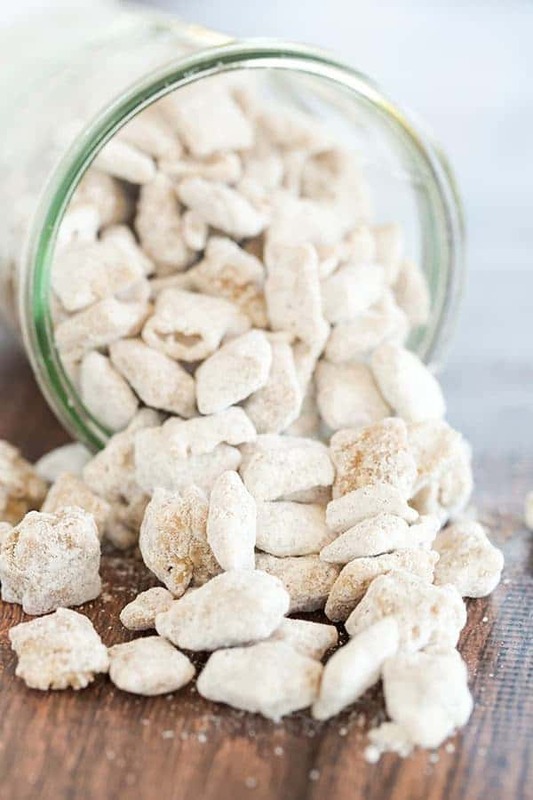 These snickerdoodle muddy buddies are an awesome spin on the original recipe and perfect to keep in the fridge throughout the fall and holiday season. Set out a bowl for snacking during football games, while waiting for Thanksgiving dinner to be ready, or while baking Christmas cookies. 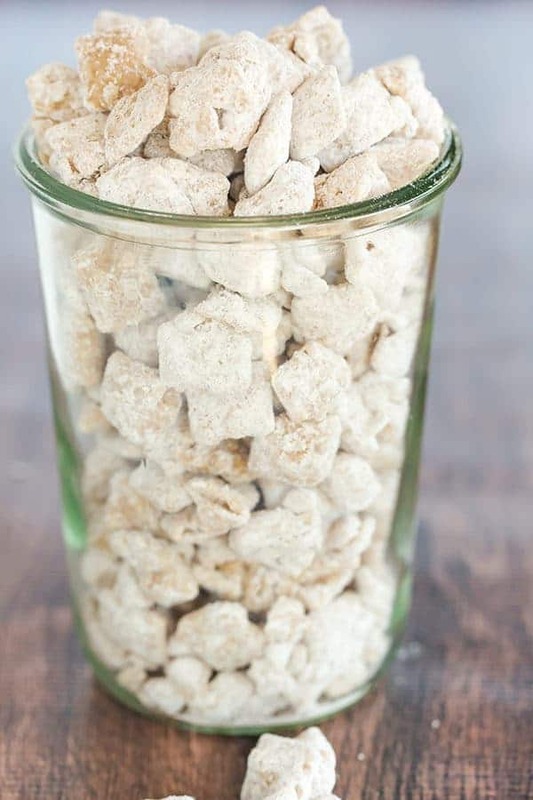 Whether you eat it by the handful or the bowlful, you’ll love this cinnamon-sugar snack – it’s super easy to mix together, keeps for ages in the refrigerator, and makes snacks for a crowd a cinch. Bring on the holiday flavors! 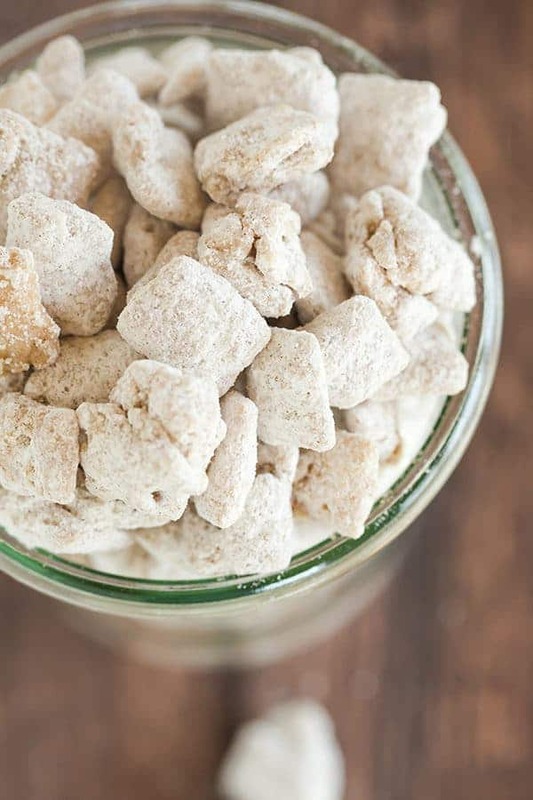 A cinnamon-sugar coated rendition of muddy buddies - one of my favorite snacks! Place the powdered sugar, granulated sugar, and 2 teaspoons of the cinnamon in a gallon size ziploc bag; set aside. Line a rimmed baking sheet with parchment paper; set aside. Place the Rice Chex cereal in a large bowl. Melt the CandyQuick in a medium bowl in the microwave according to the package directions. 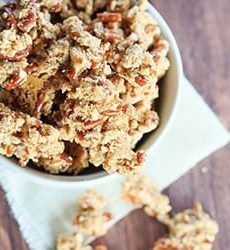 Once completely melted and smooth, stir in the the remaining 2 teaspoons cinnamon and vanilla extract, and immediately pour over the Rice Chex. Using a rubber spatula, gently stir until all of the cereal is evenly coated. Transfer the coated cereal to the ziploc bag with the cinnamon sugar mixture. Seal the bag and shake until all of the cereal is coated with the sugar mixture. Turn the cereal out onto the prepared baking sheet and spread into an even layer. Refrigerate for 30 minutes, or until set. Store in an airtight container in the refrigerator for up to 1 month. Dont post a recipe, thats not doable!! and waste of time and money! Ummm there is such a thing as CandiQuik – http://candiquik.com/ – I buy it at my grocery store all the time. And yes, white chocolate chips are generally too thick, which is why I recommend CandiQuik or candy melts. The recipe IS possible; if you read the previous comments you’ll see that others have made it. I tried making this twice just now. Using candy melts first, then white chips..and both times when I added vanilla it clumped up to where I couldnt even pour it on the cereal 😢 super sad about it because I KNOW it tastes amazing! What am I doing wrong?? Hi Tabitha, Oh no! It does get thick and start to set quickly, which is why I say to pour immediately. I find that Candi Quik has worked the best for me for these types of projects; regular white chocolate (either chopped or chips) tends to seize way to easily. I’ve never used candy melts, but I know a lot of people do. You could try using vanilla bean paste, as it’s not as liquid as extract. Hi, instead of candy quick (which I’ve never heard of) can I use white chocolate chips? Hi Jennifer, White chocolate chips don’t do near as good of a job of coating as the melted candy wafers, as the white chocolate tends to sieze and clump a bit. CandyQuick is just a brand name; look for any kind of candy melts or almond bark (other names for the same thing). 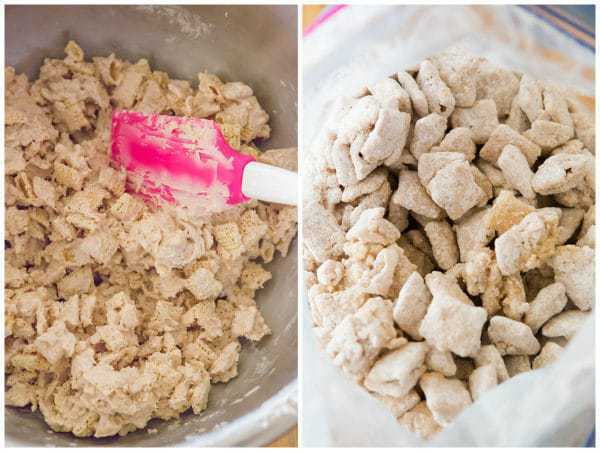 These are easy to make; I’m confused as to why the Snickerdoodle muddy buddies were discontinued. ? Fantastic! Just made these for the first time and so happy i dont have to buy that dinky little bag for $3 anymore! Hi Kristina, If your house is a warmer temperature, keeping them out at room temperature could cause the coating to get a little melty (especially if it’s summer). If you keep your house less than 72 degrees, then I think it would be fine to leave them out. I actually LOVE eating muddy buddies cold from the fridge! Michelle I tried this twice today. Once with candy melts and once with Ghiradelli Melting wafers (had the wafers on hand). When I added the vanilla, both seized up. The wafers were almost solid! The candy melts were good long enough the stir but left big clumps of cereal and chocolate. Any tips? By the way the taste is lovely! Hi Alice, Oh no! I didn’t have a seizing issue – I used CandiQuik. Maybe try just using vanilla bean seeds instead of the extract? Great day for treats!! Thanks! Aren’t Muddy Buddies the best and the worst at the same time? :) The best because they are so, so amazingly delicious, and the worst because you can’t stop eating them! This snickerdoodle version is perfect for snacking on during a football watching binge! This looks delicious!!! But I’ve never used candiquik. I also don’t have a microwave. What is your suggestion for an alternative chocolate? Also, did you use white or milk chocolate? Hi Katie, I didn’t use any chocolate, just the Candiquik (it’s like a candy coating chocolate alternative). You can melt it on the stovetop over low heat if you don’t have a microwave. An alternative would be to use almond bark. Wondering if I can use Ghirardelli White Choc. Chips in place of Candiquick? Hi Brenda, I wouldn’t recommend it. I’ve tried using white chocolate, but in my experience it really doesn’t melt and coat well enough for something like this. I don’t have access to Candiquick. Could I use white almond bark instead? Just made this with my daughter for our Friday night girls’ night and it is delicious! Thanks for the recipe! Wonder if using Cinnamon Chex would be overkill? And if using Chocolate Chex would be like a Mexican hot chocolate. Only one way to find out! I make this in the fall…LOVE IT! My recipe varies slightly in that I use some speculoos cookie butter (Biscoff brand, to be exact) in with the white chocolate. Just an extra little depth of flavor. It makes the chocolate melting a little bit, um, ‘moody’ at times but it’s worth it to me! Oooh that sounds amazing! Totally trying that next time! Hi Michelle- what is CandyQuick? I’ve never heard of it and when I googled it- nothing that came up made sense. We love Muddy Buddies and would love variations!! This is what she’s referring to. Hi Jenny, This is candiquik – http://candiquik.com. It’s a meltable candy coating, much like almond bark. My grocery store sells it alongside the chocolate chips display.